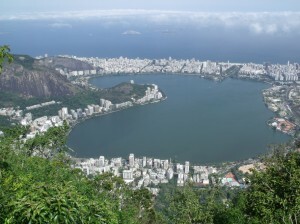 Apologies, dear readers, for the unexplained absence; but after the extraordinary success of London 2012, the only reasonable thing to do was to jump a jet immediately, and check out the next summer Olympic location – Rio de Janeiro. I was surprised to arrive at the tiniest international airport imaginable for a city of ten million people. And the ‘arrivals and departures’ board indicated barely two dozen international flights a day. Apparently São Paulo, 450k inland, is the country’s major hub. So, there obviously needs to be a bit of work done in that department. Ditto the road network. On the way downtown, the cranes swinging over the celebrated Maracanã, the national soccer stadium suggested that preparations were well underway for the World Cup 2014. But subsequent conversations with informed locals suggested otherwise, and there was no other evidence of any development, either for 2014 or Rio 2016. As far as the airport goes, recent admissions from Rio major, Eduardo Paes suggest that it might not be renovated in time for 2014, despite a plan to get private companies more involved in construction. “It’s a shame this wasn’t done earlier,” Paes was quoted in Brasil Economico last week. “For the Olympics, yeah, I think we’ll have time.” Hardly reassuring, eh what? The manageress of our Rio hotel gave the most understated appraisal of how the city might handle the two biggest sporting events on the planet. Unable as I was to masticate Portuguese (the national language), I congratulated her on her excellent Spanish. “It’s a good job,” she replied,” because after Rio 2016, I can pretend I’m Argentine or Mexican”. Then again, she sounds just like most Brits would have sounded right up to the doorstep of London 2012, especially given the security screw-up, which needed the Army being drafted in. 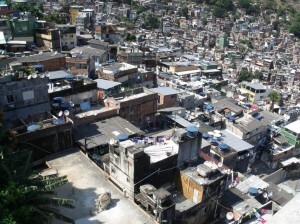 And given how the national security forces in Brazil have cleaned up Rio and many of its notorious favelas (slums, right), chances are that Rio 2016 is going to be just as successful as London 2012. Just about everyone I spoke to prior to going to Rio warned me to be careful, that it was one of the most dangerous places on the planet. And given that within half an hour of leaving my hotel in São Paulo on a trip there 15 years ago, I found myself within slashing distance of a knife-fight, I was prepared to be convinced. On the contrary. The same manageress admitted that the secluded backstreet where our small hotel was situated, about six blocks from Copacabana Beach, had been pretty dangerous “about five years ago”. But the clean-up, both of the inner cities and the national security forces initiated by former President, Luiz Inácio Lula da Silva (Lula), and continued by Dilma Vana Roussef, the country’s first woman president, looks to have been a major success, judging by personal experience. In two weeks strolling throughout Rio, day and night, including favelas (with a local), along with an exploratory drive some 200k east to the resort of Buzios, it strikes me that the footballers in 2014 are going to be subject to more threats to life and limb on the pitch than any tourists in the cities. That’s of course discounting English football fans, who could start a fight solo in their own living rooms. As for Rio itself – Cidade Maravilhosa – spectators and media colleagues, devoted hedonists as they are, will have a great time.  Olympic dates are August 5-21, 2016, which is midwinter in the southern hemisphere. But from August 30, we enjoyed temperatures no lower than 16C (60F) at night with the highest day being 32C (90F), ie a (good) London summer. And there was none of the humidity (or the 40C temperatures) of a Rio summer. The Cariocans know how to enjoy themselves, and make sure visitors do too, as was abundantly evident in every restaurant and music bar we visited. 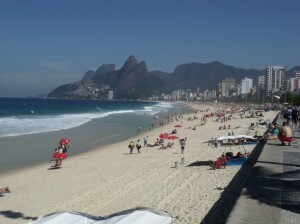 The beaches at Copacabana and neighbouring Ipanema (above, left) are quite as beautiful as advertised, with volleyball and football being played close to 24 hours daily, it seems. And the kiosks along the seafront serve the best priced caipirinhas, the national speciality, anywhere. 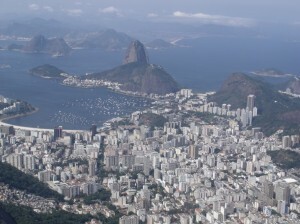 The city is built around a series of volcanic rocks/mountains, as evidenced by peaks like Sugarloaf, and Corcovado, which features the gigantic modernist statue of Christ the Redeemer, visible from pretty much anywhere in town. There is a cable car to the former, and a funicular to the latter. For those of you, like me, who still pretend to be runners, stay within warm-up distance of Lagoa Rodrigo de Freitas, behind Ipanema Beach (both right), which has a seven and a half kilometre path around it; although be prepared to weave your way through cyclists, walkers and coconut sellers; ditto for the sea-front paths along Copacabana and Ipanema, which, together, stretch another 7k. For good measure, 200k east of Rio, Buzios is an ideal location for a pre or post-Olympic vacation.